Artwork isn't just a way to decorate a space. It's also potentially a valuable asset. While this means that the Internal Revenue Service could tax you on it, especially if you sell a valuable piece for a profit, it also creates opportunities for you to use art to reduce your taxes. Whether you're buying it for business purposes, giving it to an eligible charity or creating it, you might be able to find some tax savings in an art collection. Art carries with it a variety of potential tax write-offs. Whether you are donating art to a cultural institution or decorating your home office, you can take advantage of a variety of attractive tax write-offs. 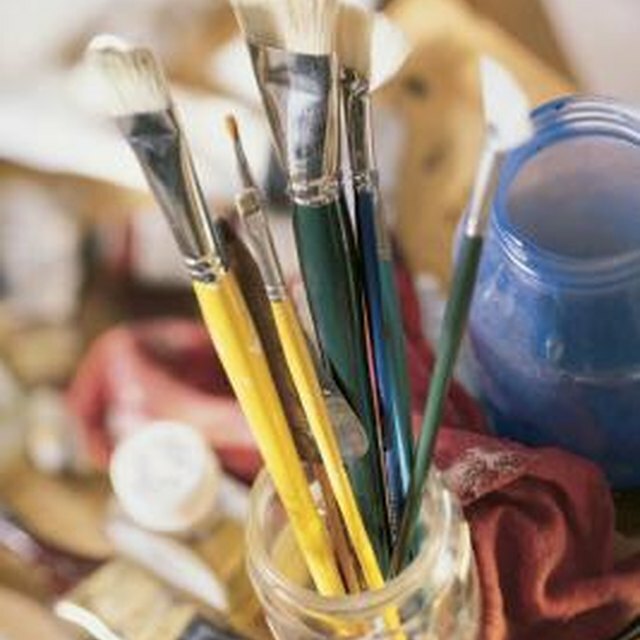 The IRS classifies art with other collectible items. When you buy art for yourself, it's treated as a personal purchase and isn't a taxable event. Selling art or other collectibles for a profit, though, triggers a capital gains tax liability of up to 28 percent, higher than the ordinary 20 percent maximum capital gains rate. If you sell it at a loss, it's not a tax write-off that you can use to offset other capital gains unless you can prove that the art was held for investment purposes instead of for personal use. Art hanging in your living room, for example, is considered a personal use asset instead of an investment. One of the greatest tax write-offs available to art collectors – it's why many museums have the bulk of their collections – is the ability to write off the value of art you donate as a charitable contribution. When you donate art to a not-for-profit organization, you typically get to deduct its fair market value at the time of the donation rather than what you paid for it, so if the art went up in value while you owned it, you could end up with a very large deduction. You'll need to own the art for at least one year to be able to write off an increased value, and you can write off only up to 30 percent of adjusted gross income in appreciated assets unless you subtract the appreciation from the item's fair market value in claiming the deduction. Depending on the value of the art you donate, you might also need to get a professional appraisal. The IRS doesn't require an appraisal for art worth between $500 and $5,000, but it needs to be listed on Form 8283 if it is valued at more than $500, and you'll need to substantiate the value of the donation if you get audited. Donations of art worth over $5,000 must be professionally appraised and, if the artwork is worth more than $20,000, the appraisal must be attached to your return. For art worth over $50,000, you can have the IRS certify its value before you claim the deduction, but as of 2018, this service carries a $6,500 fee for the first one to three items and $300 for any additional items. If you maintain a home office for which you claim a home office deduction or if you have a business for which you pay for an office, the cost of buying art for it could be a tax write-off. The IRS generally lets you write off all of your office expenses against your business' profits. You can claim the purchase of some artwork along with other office decorations, although it may need to be depreciated. However, if the artwork is "valuable and treasured," it's not depreciable. If you're in the business of creating art, the process of making art could also be tax-deductible. Setting up your artistic activities as a business allows you to write off the costs you incur, as you would any other business. However, your ability to claim losses against other income will usually be limited. In addition, the IRS typically looks harshly on deductions for what they consider "hobby" businesses. If you sell enough art to make a profit for three out of the preceding five years, the IRS is much more likely to consider your artistic endeavors a business rather than a hobby and allow you to claim your deductions. You can also donate the art you create, but you can write off only the cost of your materials, rather than its fair market value, since the IRS won't let you deduct the value of your time.